The former coach of the Russian men’s national basketball team sums up the results of his work and tells Izvestia why he decided to leave. David Blatt’s tenure as Russian national basketball team coach got off to an inauspicious start with a series of losses in friendly games. He was on the brink of being fired ahead of EuroBasket 2007. One month later, however, he won the first title in the history of Russian basketball. 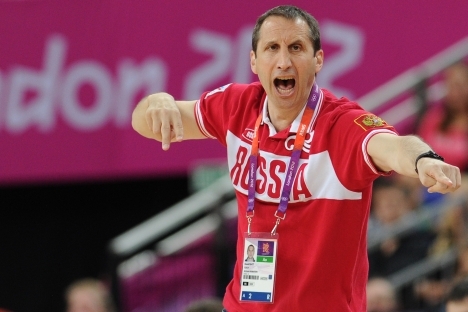 When Blatt brought bronze home from the London Olympics, basketball fans across the country were so excited that they were ready to erect bronze statues of him at every major basketball arena in Russia. The most successful coach in the history of Russian basketball speaks about his seven-year stint in Russia. Izvestia: EuroBasket 2007 was a triumph for Russian basketball. How did you manage to do so well then? David Blatt: We had a remarkable team back then. We got rid of the whiners who didn’t want to play for the national team, and we created an excellent vibe within the team. Every player was ready to do what it took on the court to get the job done as a team; personal glory was thrown out the window. Our road to the final was phenomenal, and I thanked the team for the miracle before the final game. I thanked them and made it clear that the tournament was already over. We had performed way beyond our expectations, and the only thing left was to collect our silver medals. The guys were sort of hurt by my speech, although we clearly had no chance against Spain. But you know the result. We managed to beat them in front of their home crowd with the last shot of the game. It was a real miracle – something incredible. That game showed everyone that nothing is impossible. Izvestia: That victory became the turning point in many players’ careers. D.B. : That’s what I’m saying. When you work hard, everyone has a chance to achieve something truly great. Izvestia: Were you planning on winning a medal in London? D.B. : It was a different story and a different team. We were breaking stereotypes in 2007, but this summer we knew that we were worth a lot more. We knew that we could do well, but we never forgot that our chances were pretty slim. Nevertheless, we managed to win a medal and became one of the strongest teams in the world. That was our greatest achievement. But that was the end of the story – a story that started when we had just set off on this path. The guys earned respect as individual players; but more than this, they earned respect as a team. Izvestia: You are responsible for producing a number of talented players during your seven years in Russia. Who do you think is the most like you? D.B. : Well, there’s Vitaly Fridzon, for one. Where did he come from, this one? From nowhere! But he became one of the best players in the world, through effort and hard work. I was truly sorry when I had to cross him out of the list of the players for the national team. I thought then that there were better players, but Fridzon never gave up, and he is now the true leader of the national team. You saw him playing at the Olympics. He was killing his opponents. D.B. : True. I don’t want to hurt anyone’s feelings, but Sergei Monia is a special player. He is the best captain, the best human being and best athlete that I have ever trained. He’ll do anything for the team. Of course, Andrei Kirilenko is a superstar whose talent helped the team climb to the very top, but Monia is my captain. Izvestia: How can you leave the team that you love so much? D.B. : Nothing lasts forever. We had seven wonderful seasons together. I’m proud of this team, and I will always cherish these memories. We pushed beyond our limits and managed to change people’s attitude towards the national team. We survived the uneasy change of generations. We gave absolutely everything, but this can’t last forever. Russian basketball is on the right track. I’m sure it has a bright future. D.B. : Whoever comes, he will benefit from what I have left behind. It’s not my place to talk about who should come next, but I hope the new coach will enjoy the same trust as I did. Whoever leads the team, I will always be rooting for it. A piece of my heart will always stay with the Russian team. Izvestia: Is it symbolic that the Greek coach Fotis Katsikaris once took over from you as the coach of Dynamo St. Petersburg, and now he is the main contender for the Russian national team job? D.B. : He always knows what’s right for him, just like I know what’s right for me. But there have been no official announcements, so it’s a bit premature to speak about it. He is a good coach, but let’s wait for the official announcement. Izvestia: Three reasons have been suggested for your resignation: money, a move to the NBA and the fact that the Russian national team leaders Kirilenko and Khryapa may end their careers soon. Is that true? D.B. : These are valid reasons, pragmatically speaking. Kirilenko and Khryapa are great, but Russia has many talented players. Alexey Shved is playing the best ball of his career and Sergey Karasev is a star in the making. The fact that he made the Olympic team at the age of 19 is proof of this. The change of generations is always a challenge. But Russia has an excellent future. As for the money, it has never been the main factor. And as for the NBA, well, little depends on me. For me to get there, someone has to want me there. Anyway, I have one of the best jobs in Europe. And when I was coach of Russia, I had two of the best jobs in Europe. The NBA is not something to be obsessed about. If I get the chance to coach in the NBA – if the place and the timing are right – then I’ll be ready to give it a go. But that’s not what matters right now. Izvestia: You seem to have a very positive attitude to everything. Have you ever experienced failure? D.B. : Who wants to talk about their failures? Of course I remember my failures: I remember how we failed to make it through the group stage in Beijing; I remember giving up on talented players who were doing their best and earned a spot in the national team. I remember making mistakes, but don’t make me talk about them, please. Izvestia: Do you remember the losing streak, when the team was beaten quite handily in all of its friendlies ahead of a championship that it ultimately won? D.B. : You know, no one believed in us then. We hadn’t peaked in terms of conditioning – in terms of playing as a team. I asked the team to practice the things that they weren’t so good at in those games. If those results had really mattered then, we would have played differently. The point difference wasn’t that bad. But the guys believed in me and played the way I asked them. We lost by 40 points to France, remember? But we beat that same talented team in the playoffs – because I believed in the players, and they trusted me. The interview is first published in Russian in the Izvestia newspaper.